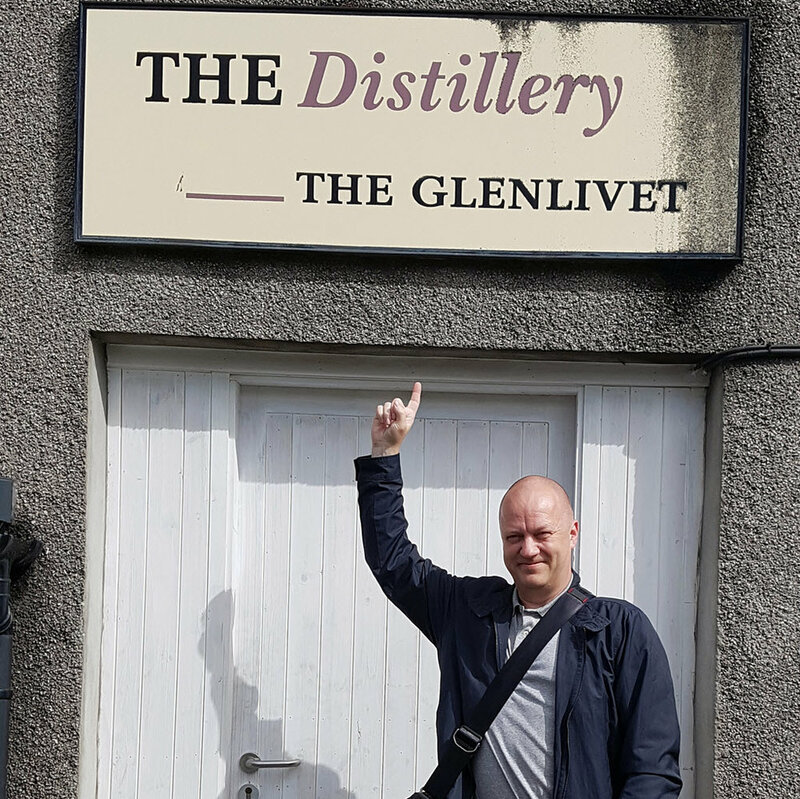 A few weeks ago I had the pleasure of visiting the Glenlivet Distillery for the first time. I have been to Scotland around a dozen times so far, every time with some sort of whisky focus. Still I have never really taken the time to explore the Speyside region. I have driven through, and made a pit-stop or two, but that is more or less it. That is - until now. This latest trip would take me to three of the distilleries owned by Pernod Ricard / Chivas Brothers, and to Speyside Cooperage. This will all be covered through a series of articles over the coming weeks. We arrived in Scotland at Aberdeen Airport, the best airport to use when flying in really, as both Glasgow and Edinburgh are much further away from Speyside. From the airport it took us around 90 minutes by rented coach to get to our first stop. Google tells me you can do the same trip using public transport, in about 4 hours. The first distillery on this trip was the massive Glenlivet Distillery. Established in 1824, it has run almost continuously since. The capacity was stable at around 5 million litres for many years. Then in 2009/2010 the capacity was double to 10.5 million litres! We first had a stroll around the large visitor center, fully equipped with a shop, a museum of sorts, and a café with great food (and Irn-Bru!). After a quick bite we set off on the tour. One of the highlights for me was the old Porteus mill they had on display. They had cut off parts of it to show the inner workings of this impressive mechanical beast. We also got to see the smallest licensed still in Scotland. It is still used to distill a few litres of spirit at the annual Speyside festival. The tour took us through the new portion of the distillery. It was all very clean and tidy, and impressively huge. There is a monster of a Briggs mashtun at 13.5 ton capacity, where a batch takes 3 hours to run. They use three waters, the first at 69 degrees, the second at 79 degees and the third at 89 degrees. The third water goes back and is used as the first water for the next mash. They have a total of 16 wooden washbacks, each with a capacity of 40 000 litres. The fermentation time is 52 hours, with a resulting wash at around 9 % ABV. There are a total of seven pairs of stills at the distillery today, where three pairs are from this latest expansion. These are very high stills, which produce a light distillate. The low wines produced in the wash stills come in at around 24 % ABV. The heart is taken from 70 % ABV to 64 % ABV off the spirit stills. Over the past five years the Glenlivet has experienced an incredible sales increase of 39 %. They are today the world's second most sold single malt, only beaten by Glenfiddich. With this high and increasing demand plans are well underway for further expansions. Consequently the capacity will double again next year, to 20 million litres. Test runs are scheduled for January/February, and they are looking at full production from March 2018. A further expansion to 30 million litres is also being prepared. This is, as yet, only said to happen within the next ten years. With such a huge production, you would perhaps think that a portion of the production would go to blends. That is not so. All production, with some minor exceptions, goes to produce Glenlivet single malt whisky. In the warehouse we saw the very first casks filled with spirit produced in the new stills. Furthermore we saw a tagging system for casks, that I have not seen before. Traditionally cask ends are painted to indicate whether we are looking at a 1st fill, 2nd fill etc. Here they use metal tags with the following key: Blank tag = 1st fill, blue tag = 2nd fill, 2 blue tags = 3rd fill, red tag = 4th fill. The visit was of course not complete without a tasting. In one corner of the visitor center we found there was a semi-hidden door, speakeasy-style. The door led up a flight if stairs to a very nice tasting room, where we sat down to nose and sip a few whiskies. My absolute favourite was the Glenlivet Nàdurra Oloroso Matured, followed by the 16 YO single cask edition and the Nàdurra First Fill Selection. After the tasting we decided to go for a walk. A bit of fresh Scottish air does wonders after a heavy tasting session like the one we had just experienced. Hence we walked up the hill behind the distillery, up to where the distillery was originally located. It was about 20 minutes walk, with great views of the nearby area. Close to the original site we also saw Josie's Well, the original water source and a natural spring. Now it looks a lot like a Hobbit's house. It was all a very positive experience, and I would certainly not mind dropping by again on a later visit to Speyside. Please note that my visit to Glenlivet Distillery was a press trip sponsored by Pernod Ricard / Chivas Brothers. All the text and the opinions are my own, but you deserve to know.